A 700-year-old monument gets its first full makeover. Add one more attraction in the historic Nizamuddin Basti, apart from its dargah and the famed Thursday qawwali sessions. 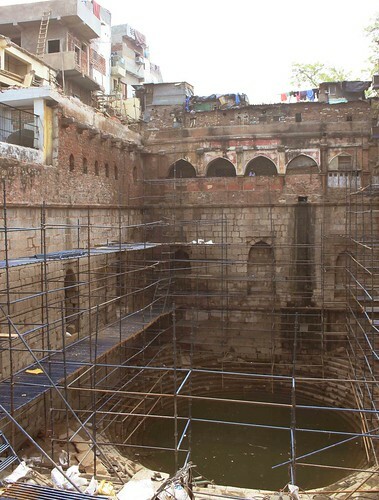 The ancient baoli, or step-well, built by the sufi saint Hazrat Nizamuddin more than 700 years ago, has finally been spruced up after what seems a lifetime of its treatment both as a sacred place and as a dumping yard. “At 4 pm on Sunday, March 15, 2009, we removed the last of the malwa and reached the well’s wooden floor,” says Mr Ratish Nanda, the project director of Aga Khan Trust for Culture, an international philanthropic organisation that has fixed up heritage places as diverse as Delhi’s Humayun’s Tomb and Cairo’s Al Azhar Park. While Delhi has baolis scattered in places as far apart as KG Marg and Mehrauli, the one in Nizamuddin Basti is the only one to still have an active underground spring. Thanks to the sufi connection, its water is considered blessed. Even though some of the beggars living around the dargah dropped their excreta-filled polybags into its water, pilgrims still flocked for a sip. However, after seven months of hard work in which tons of stone debris, decomposed filth, plastic and toxic water was removed manually by 70 labourers, besides relaying the sewer lines, the baoli’s sacred water has become safe, too. “It’s the first time in 700 years that the kuan has been cleaned,” says Mr Farid Ahmad Nizami, a peerzada in the dargah. Attempts had earlier been made to restore the baoli, but no one could reach to the foundation. Most would stop where the stairs end and the well starts. But the step-well is dear to millions of Hazrat Nizamuddin’s followers and holds a special place in Delhi’s architectural landscape, too. Its walls are made of huge blocks of Delhi quartzite, the city’s only local stone, which is also seen in the Tughlaqabad fort. In fact, during the restoration, each of the 550 stones was X-rayed from five different points to spot any voids behind the wall. “It was disturbing to see people drinking from here but now I will also come and have my share of the blessed water,” says Ms Sadia Dehlvi, author of Sufism, The Heart of Islam, and resident of Nizamuddin East. Indeed, once the work is finished, the baoli may again become what it was intended for: a meeting point for Hazrat Nizamuddin’s followers, a sort of Banaras ka ghanga ghat – sufi style! hey this is a good news….after such a neglect…it is now getting restored and revived. I’ve visited this place once but now I’m looking forward to visit this place again after the work done! !